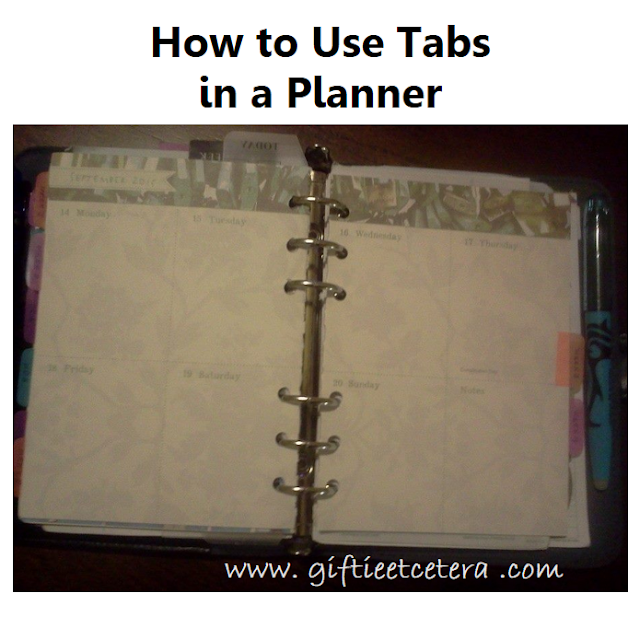 I've talked a lot over the years about how I use tabs in my planner (especially when I discuss my projects section), but I've never really focused on the tabs and how I position them. My main rule is that I limit the use of TOP tabs to the most important three pages. They are pages that I access almost daily. 3. my current weekly spread. Maybe you only have one or two of these pages. Whatever your daily pages are should be marked differently (in my case, as top tabs) than all your other pages. That way, the daily stuff is always easy to find. TIP: If there is a page that you use daily, use a top tab. For everything else, use a side tab. I've always paper clipped my weekly spread to the divider and it opens right up to the current week. I do the same with my monthly spread. I use two Filofax bookmarks for this...my monthly and daily pages. Love the newer clear ones! Just yesterday I was thinking that I need some new bookmarks or top tabs. I was using a paperclip with a ribbon to mark my spot in my daily page (paper clipped to the month to flip back in forth.) But now I moved that to my current project that I am referencing about 100 times/day. And it made me realize I need to tweak my system just a little. Yea! Shopping for planner accessories. On a side note, every time I see your Paris pages, I want to buy them. Oh, the power of suggestion. I love things with pictures of Paris or a few French words or terms. The reality of Paris and speaking the French language, not so much- it's nowhere near as fun! Ooo-la-la! What stores might these Orange Circle planners be sold in? I'd like to look at one in person. I got my Orange Circle Planner at Barnes and Noble. I do not use top tabbed dividers too often, but I do use page markers that I found at Franklin Covey. A set of five with yellow, orange, red, green, and blue. I use the yellow for "Today" stuff. The red is used for "Soon Upcoming". Orange is for "Pay Attention". Green is financial. Blue is for "This month". A standard page marker works to mark where I am in the midst of planning something. I am using a Day-Timer Rose Gold "Desk" sized planner with printable weekly and daily insert forms from Becky at "Planner Fun". My planner is always with me and it gets a lot of use.